Healthy Lifestyle: Which Salts Are You Using? Salt is an essential element for life to exist. Salt is used in cooking, baking, seasoning and there are even some salts specifically used in body exfoliation products and bathing. 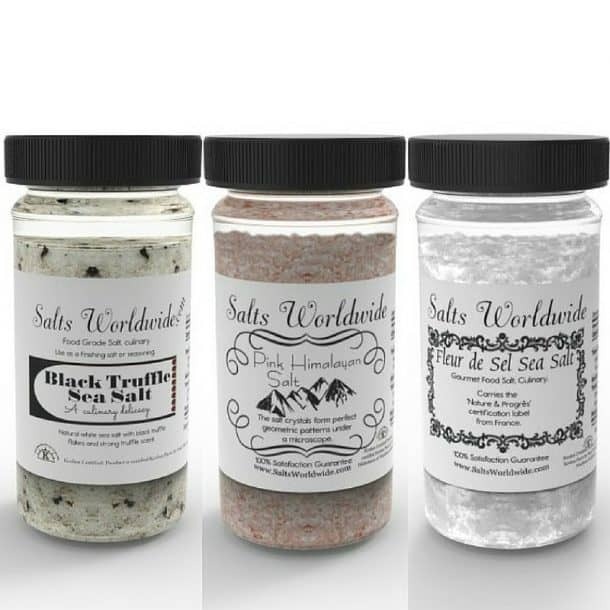 There are many different culinary salts to choose from–and there may be one distinctive salt with a reputation of complimenting every single cuisine. Baking with or adding as a finishing salt, Fleur de Sel can replace typical table salt with the pristine, pure sea salt taste that will bring to life every meal. Salt and pepper shakers are commonly displayed on tabletops worldwide. Since salt is an essential food item, the quality of the salt is important. Sea salts from salt deposit beds from around the world are gathered using delicate techniques to retain the real, raw nutrition that sea salts provide. 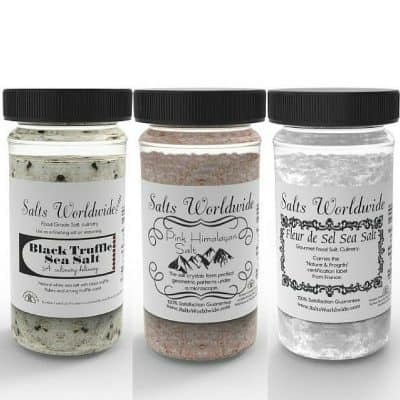 Salts Worldwide Fleur de Sel is extremely versatile, although the French Sea Salt, Pink Himalayan Salt, Black Hawaiian Lava Salt, and Red Alaea Hawaiian Salt are all viable options to replacing typical table salt. With every dinner, dessert, or loaf of bread this pure French Sea Salt is enjoyed by chefs, home cooks, and the diners alike. 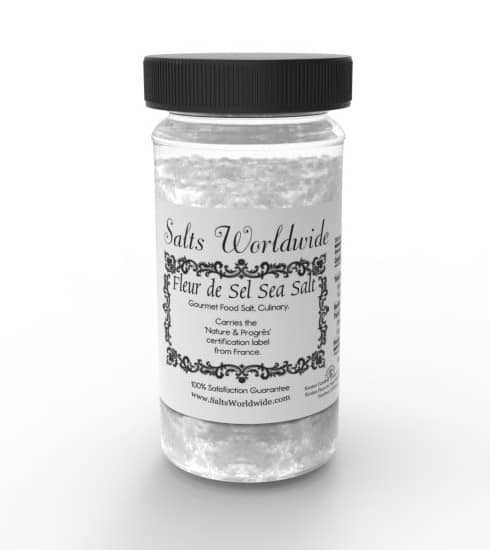 Compare Salts Worldwide Fleur de Sel salt shaker jar to the one you have in your kitchen. This salt is exquisite; a pure and undeniably delicious culinary salt. Lightly sprinkle this salt on your foods and redefine the definition of salt in your kitchen. Known to be one of the highest quality salts money can buy, Fleur de Sel aka Flower of Salt is Kosher Grade and carries the Nature and Progrès certification ensuring its excellence and purity. This salt is harvested using methods passed down from generations. The methods utilized involve harvesting this rare salt by hand, and skimming the top of the salt ponds for the purest crystals that formed above the top layer. This is what separates Fleur de Sel from other salts and Sel Gris, as Sel Gris is harvested below the surface. This salt is neither ground nor crushed due to how it is harvested. It is sought after by some of the top chefs in the world not only for the wonderful exquisite flavor it provides, but the light and moist texture, the high mineral content is an added bonus! It is best utilized in a salt shaker or as a finishing salt. It is excellent for seasoning fish, poultry, pasta, meats, risotto, salads, vegetables (either grilled or steamed) or sprinkled on top of candies and chocolates. Fleur de Sel is the go to salt for professional chefs and serious foodies who want to add high quality flavor to their dishes! When the salt is stored properly, it has around a 10 year shelf life. Fleur De Sel or Flower of Salt is a Gourmet Grade Kosher Salt, that is harvested using ancient methods passed down from generations. 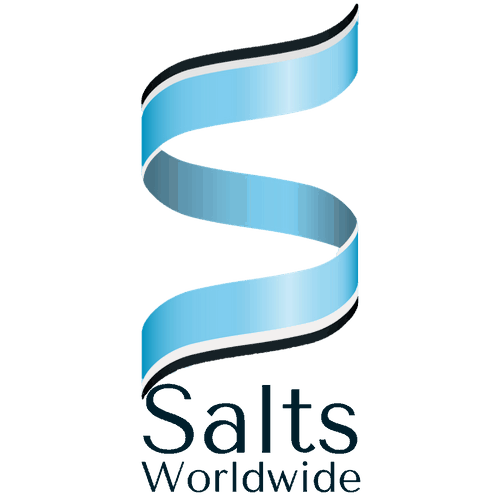 This is one of the highest quality salts money can buy, it is neither crushed nor ground, it is harvested by skimming the surface of the salt ponds and only obtaining the salt crystals that formed above the top layer. This is what separate Fleur De Sel from Sel Gris, which is harvested below the surface. Fleur De Sel carries the Nature and Progrès certification ensuring its excellence and purity. It is sought after by the best chefs in the world because of the light and moist texture, as well as the high mineral content and delicate flavor it provides. It can be utilized as a finishing salt or in a salt shaker. It is excellent for seasoning meats, poultry, fish, pasta, salads, risotto, on top of chocolates and candies, and on vegetables (either steamed or grilled). Fleur De Sel is ideal for professional chefs and serious food enthusiasts that are looking to add an unique amazing flavor to their dishes. Our plastic packaging is FDA approved and BPA free! When stored properly this salt has a shelf life of 10 years.